THE JUDAS GOAT is a literary magazine which features the poetry, short fiction, creative non-fiction, and artwork of Wayne State College students. The magazine is edited by the editing & publishing students and published annually in the spring by the WSC Press. The first Goat was published in 1967 by the Lit Club and in the spring of 2017 we celebrated the 50th edition. For updates on the current Judas Goat, please follow us on Facebook. Jim Mercer’s essay, “Judas Goat of the Past: A Revisionist History,” has some typical Mercerean humorous exaggerations. The radical poet he mentions had nothing to do with The Judas Goat. Almost everything he says about the history of the magazine before his time is a fiction. 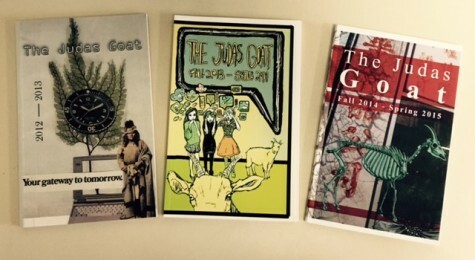 The Judas Goat was first published in l967. The Literary Club of Wayne State College (later known as The WSC Literary Club and finally before it expired as The WSC Lit Club) was the publisher, and the faculty sponsor was Sally McCluskey. When Sally left, the students asked me to be their sponsor, and I remained the sponsor for several years. I remember the Lit Club met irregularly–we mainly read our poems to each other and frequently met at my house. There was a committee which selected the literary pieces to be included in the year’s issue. The Lit Club sometimes put the magazine together with the Art Club. At first the Judas Goat was not funded by the college or student senate but by the members themselves who made money by food sales and other activities. One year I made egg salad sandwiches–most of which were eaten by Sayre and Bonnie Andersen’s dog. One year The Judas Goat was issued as a special issue of THE WAYNE STATER–the President, however, sent me a bill for the issue at the end of the term, and I paid it–$l50. Some of the earlier issues were printed on newspaper–some were mimeographed and stapled. The Lit Club continued to publish the Judas Goat until it died out; Sigma Tau Delta then took on the responsibility of publishing it. Somewhere along the way the Student Senate began to fund it. For further information: It has been almost 50 years since the Judas Goat began, and my memory is not as accurate as I would like. But several years ago I gave an interview to The Wayne Stater about the origins of the Judas Goat–that should be more reliable than the above (if anyone can find it). Also I gave the copies of old issues to the WSC library. Memory is more like syrup than amber. Instead of preserving history like that ant in the pendant seen for sale in every catalog targeting America’s intelligentsia, memory syrup is dynamic. It seeks its own level at a slower pace than water; the rate affected by the weather of one’s life. It is not that clear Karo syrup either, but darker. Maybe like real maple syrup which not only can hide a few details that we’d like to forget, but it also crystallizes into tiny prisms, turning what we are looking back at into some cubist painting of the original. Well, I’ve beaten that metaphor to a pulp, but you see what I’m getting at. Next time you are at a family gathering, compare notes on some event from your childhood with your siblings; you’ll be amazed at how they can misremember an event you recall with clarity. It’s like they have been drinking Windex and rum for too long, and they will think the same of you. That said, here’s what I remember about editing the Judas Goat in 1976 or 1977. I went to my attic to find my copies of the magazine in question, and came up empty. Now, I have my report card from third grade in George Marks Elementary School in DeLand, Florida, but not the Judas Goat. I spent the rest of the afternoon going through my collection of ballpoint pens with advertisements for co-ops and gas stations. I thought the collection would be valuable someday, financing my retirement; but they just take up space. If anyone wants six pounds of pens, you are welcome to them. Some of them write. I did find a 1980 copy of the Goat edited by Tom Edmisten (Hey, Tommy), and a 1967 copy edited by Norvin Hansen. Norvin’s had about 15 contributors and Tom’s had 10. I suspect the ones I did had about the same number of contributors. It seems like so few considering the number of students in a college, but let’s face facts—there aren’t all that many people at college interested in college poetry or fiction. I used to think that student literary magazines were published to satisfy the egos of the contributors and that there was little audience for the magazine at large. Well, I still think that, but I don’t think it’s a bad thing. At least the contributors are putting something creative out for the public to either admire or ridicule, and it’s the latter that makes what writers do courageous. Maybe courageous is a strong word, but there is an undeniable element of risk in publishing at any level, from a family’s Christmas letter to an article in a magazine that advertises amber jewelry. So, the 1967 version is volume two, number one which means, I think, the second version and the first on of that year…probably the only one that year. I may be wrong. No one since Ben Franklin understands what volume and issue means which is why no modern magazine bothers identifying the two. The format of both magazines is 8 ½ x 5 ½, which is , I think, a quarter folio. Maybe it’s an eighth. The editor of this will have to figure that out; I’m just the author and have forgotten much of what I learned in J.B. Morgan’s print shop in Norfolk. Gilbert Vaughan was the faculty advisor when I was editor. He told me that the magazine had not been published in awhile because the previous advisor was the poet-in-residence who, in typical faux radical style, quit because he was pissed off about something. Probably nothing, but he was pissed off nonetheless because young professors were supposed to be angry at the establishment. Hell, I was mad for a while, but I got over it when I was 17, or so as I recall. Yeah, our parents and grandparents did some stupid things, but it’s not like my generation has done much better. We let George W. Bush steal an election without much protest, allowed him to create the Homeland Security Office, and drive a stake into the heart of public education with the No Child Left Behind Act. Am I the only one who read 1984? Anyway, this radical poet whose name I disremember (Gilbert remembers him) ran the Judas Goat, which I find a curious name for a literary magazine. Is art merely a decoy to lead us to slaughter? Well, if you try to make a living as a poet, it probably is a Judas goat. So, he was the sponsor until he went whack, stripped naked and sat in a rocking chair in Hahn until the college had him committed. Ok, he probably was just fired and handed out mimeographed flyers of protest, but in this version he leaves to live off the trust fund his grandmother left him. She inherited the fortune from her husband who sold patent medicines to coal miners in West Virginia, but died in a train derailment outside of Pittsburgh. That’s my version, which will become history unless someone who was there edits this. But I digress. So, Gilbert, being the young, conscientious and competent professor he was, felt an obligation to continue the tradition the poet of questionable history may have started. I mean, think about it: You are a young English professor at a college that does not have a student publication. You have a moral obligation to make sure the college actually practices what it teaches: literature is an essential element of human culture. To remedy this inexcusable situation (the one without the publication), he recruited some journalist, Mark somebody (check a 1974 Goat) to jump-start the magazine. Good job, Gilbert. I showed up at Wayne in 1975 as a transfer student from Norfolk’s community college where I edited the newspaper and the literary magazine Voices and Visions from Nowhere and landed happily in one of Gilbert’s classes. The next thing I remember is that Gilbert is pouring Pabst Bock beer down and trying to convince me that it’s my destiny to be the editor of the Judas Goat. That’s a fairly accurate account of how I became involved. There may have been a girl involved, but there was certainly Pabst Bock beer. I recently read that PBR is making a comeback on the left coast among young hipsters. This was 30ish years ago. No matter how you cut it, that’s a long time, but I remember the smell of laying out the magazine, which I did in one afternoon, applying years of journalistic training in layout. I have no eye, but I could get pages to fit, lacing the poems together in a way that seemed profound at the time. The profundity may have been provided by Pabst. Layout smelled of musty paper—the must of high acid newsprint and early spring and cigarettes—and the ghosts of the pre-renovated Humanities Building, which I notice, is still devoid of a name. Mercer Humanities Building has a nice ring to it since there is already a dorm named for John G. Or maybe the Ruby Pedersen Humanities Building to make up for the college having officed her in a book closet when she should have had a suite and been carried by administrators in a sedan chair. Musty. I’m not clear on how we solicited poems, though if you read the masthead and table of contents, a reasonable person could figure it out. I typed the table of contents on an IBM Selectric whose typing ball mystified me, but whose real contribution was its correction feature. My 1950’s Smith-Corona portable had now such feature which made typing a real chore and made me appreciate the IBM’s technology of correcting up to 18 characters. Cut and paste meant cutting and pasting. Layout was more science than art given the technology. I knew about how many typed lines equaled an inch (having spent a few years setting type by hand), and drew boxes the size of the poem on a page with the title of the poem written in the box. That was layout. The first time any of us saw what the magazine would look like was when we (I) cut and pasted galley proofs to paper the size of the magazine to give us an approximation of the appearance of the magazine. Truly old school. I remember arguing with Gilbert and another student (Oberst may have been his name) about what poems got in, whether to accept short fiction, whether to accept works by professors, and whether to drink more beer and smoke more cigarettes. I think we did all three. What happened to Oberst is a mystery to me. He was a much better poet than I was then, or so I thought. My poetry was too much Richard Brautigan and not enough Emily Dickinson, if you catch my meaning. Not that Brautigan didn’t produce good poems. Someone told me a wild tale about the student who might be Oberst. He crashed and burned in the Education building where Professor Dugan snorted Vick’s inhalers with some regularity and regaled students with his antics aboard his Honda 90 with the step-through frame. I doubt the tale was true, and I don’t feel like slandering the guy since he did work on the magazine. I think. Maybe he was one of the several people who didn’t show up to help on the magazine. Many people didn’t show up. Most of them didn’t, which was okay with me because others just get in the way. Maybe it was my autocratic style that kept them away; sometimes it’s just easier to do the work yourself. I’m a firm believer in the saying that none of us is as inept as all of us—especially when you are trying to meet a musty deadline. The girl supplied the artwork, I supplied the editing, and Gilbert supplied the beer. The magazine was published and received rave reviews from peers and the professorial types in the department, which now boasted a student publication. I doubt the administration even read a copy, but such is the way with their people. 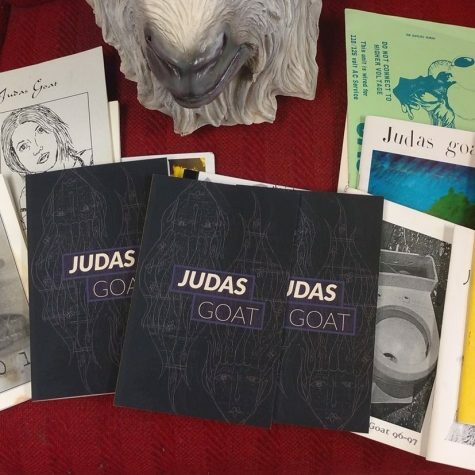 So, those are my memories of producing the Judas Goat—flirtation, intoxication, argumentation, publication, and poetification. Education doesn’t get much better than that.